Performance with more than a pinch of comfort is the recipe for the Elan E4 Family Edition, the slightly more mellow sibling of the sporty S4. Elan's E models constitute a slightly toned-down version of the all-out performance boats of the S-Line, which feature the signature chines in their hulls, twin rudders and twin steering wheels as well as T-shaped keels with low-aspect ratio fins. This is important to note because to the uninitiated observer the differences might not be so obvious. 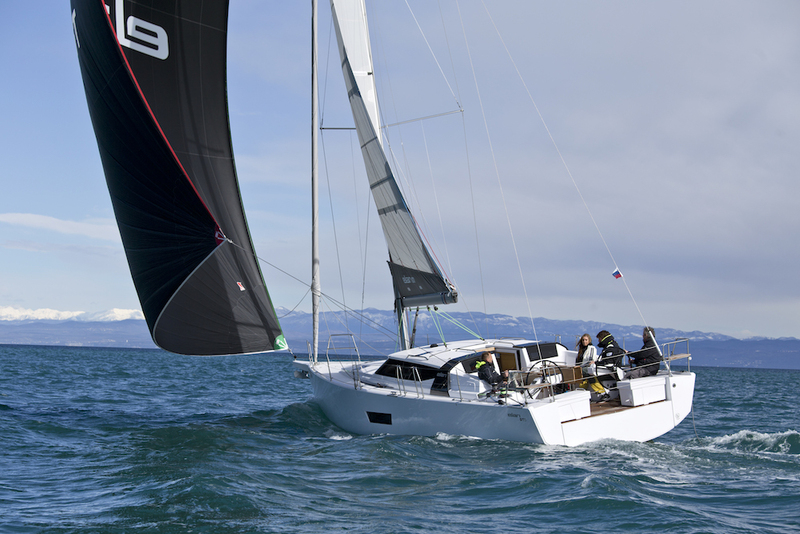 While the S-models feature weight savings with lighter interiors (i.e composite bulkheads), plus upgraded hardware and an optional carbon rig, the E4 Family is kitted out to serve both racing and cruising purposes. Both E and S series are built with vacuum infusion and vinyl ester resin. 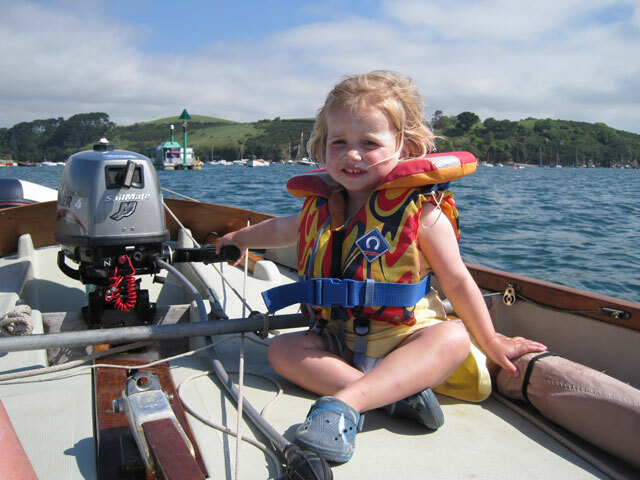 We only sailed the E4 in light winds, but that was enough to get the measure of this family cruiser. 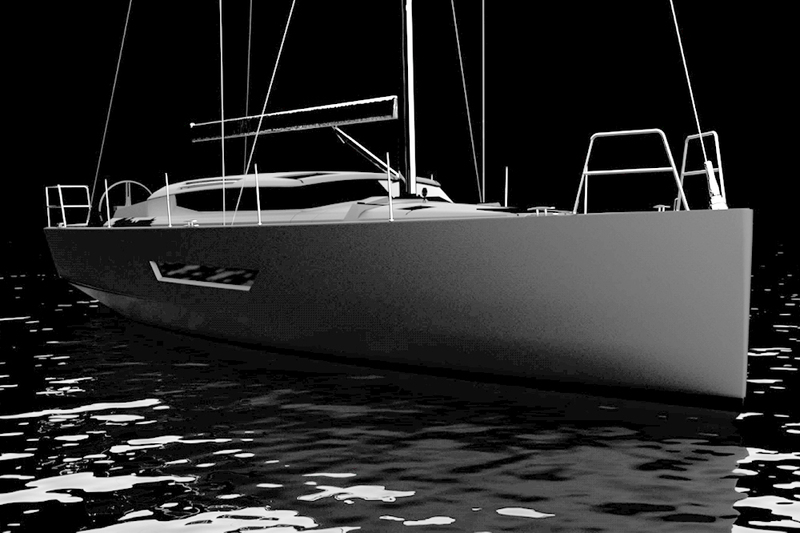 Photo: Elan Yachts. More similarities on deck where the hatch for the anchor locker also provides access to the retractable bowsprit for the asymmetrical reaching sails. Carbon and a setup that enables the crew to operate the pole from the cockpit are optional. Telltale signs for the performance bent of the E4 are the color-coded control lines that run in plain sight on deck and the mainsheet system that's rigged in the German Cupper style, meaning it runs forward on the boom and then all the way back to winches that are positioned by the two steering stations in the cockpit. 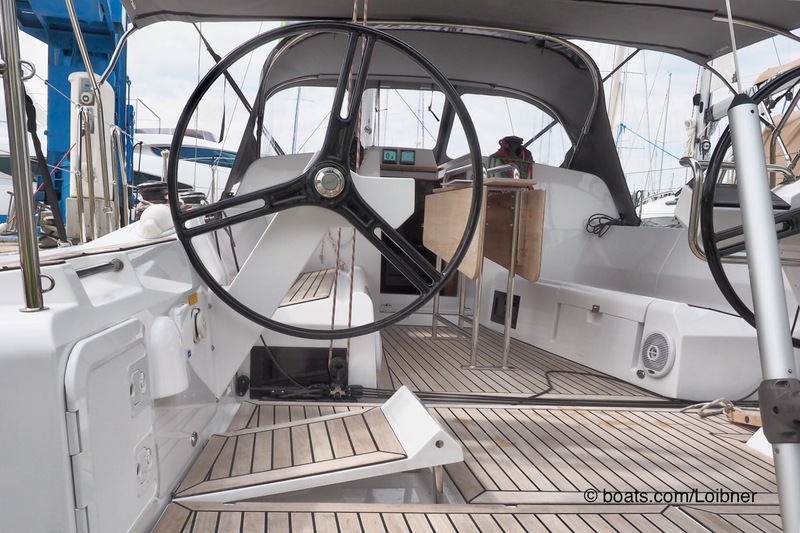 And the cockpit is where the nods to comfort and style on the E4 Family Edition become more apparent: Teak surfaces, a fixed table, a dodger and a bimini. Also notable here are the stainless-steel grab rails that prevent the mainsheet from snagging on the steering pedestals and their rotating instrument screens. A simple yet immensely useful detail is the adjustable platform that helps the helmsperson keep a safe footing under heel. For safety reasons, but also to satisfy the requirements for certification by Germanischer Lloyd, Elan installed the lowest board of the washboard so it simply flips up on two hinges. Below decks there is an L-shaped galley with two sinks and plenty of storage. Descending the companionway steps is descending into the comfort zone on the E4 Family Edition: L-shaped galley with two sinks and top-loading reefer and plenty of storage in the drawers and cubbies. The head and shower across the aisle to starboard features a dedicated wet locker for the dripping foulies when coming off watch. It is another one of these details that are easily overlooked at boat shows, but greatly appreciated on a rough and tumble day on the water. This boat comes with two or three cabins and one head only. In the reviewed three-cabin version, the head compartment was moved a tad more forward, pinching the couch space a bit, but Elan still managed to install a chart table that converts to a seat when not in use, simply by flipping it on its head. A clever solution that provides at least some dedicated space, however small, for chart work. The keel-stepped mast required a creative solution with a saloon table that has two fold-down leaves, but it also provides a practical place to hold on when moving about this part of the cabin when at sea. 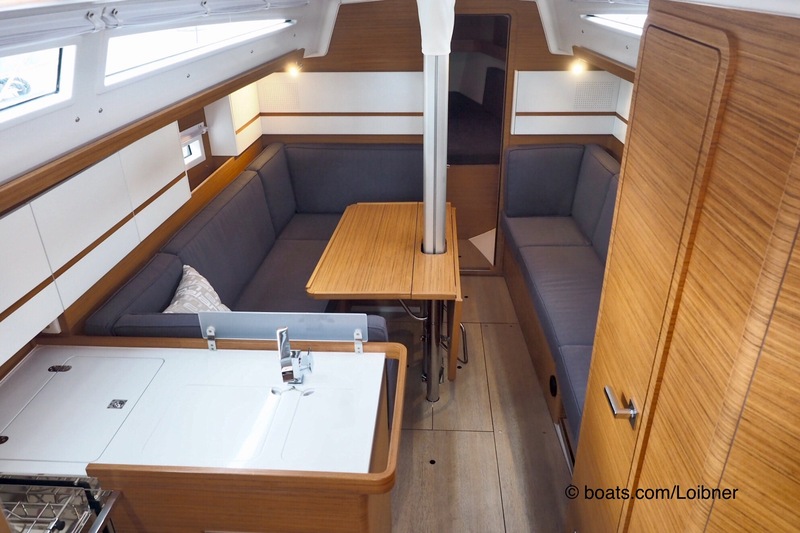 The fore cabin is fitted with a V-berth that has storage on shelves and cabinets and under the mattress where Elan also installed the water tank. 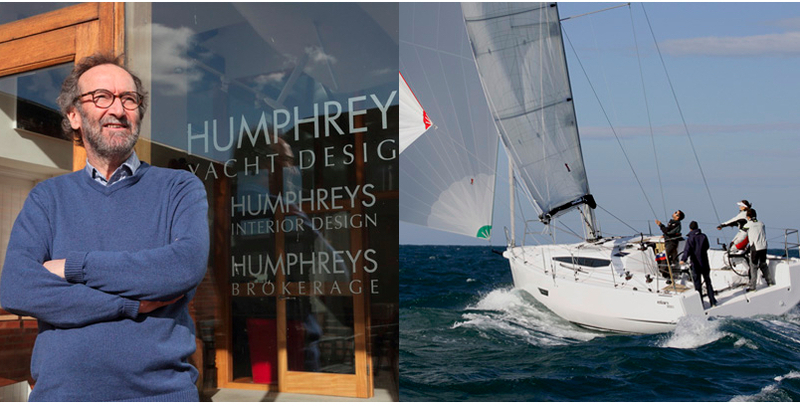 The two aft cabins are a tad more cozy, but of sufficient size for two regular sized adults who packed their seabags with the site limits of a 10.6 metre yacht in mind. Access to the 30-hp Volvo Penta auxiliary is easy after flipping up the companionway steps. This engine will propel the E4 Family Edition to a top speed of 7.5 knots knots at 2,800 rpms while the cruising tempo is six knots at 2,200 rpm. We only about nine knots of maximum wind speed for our sailing test. 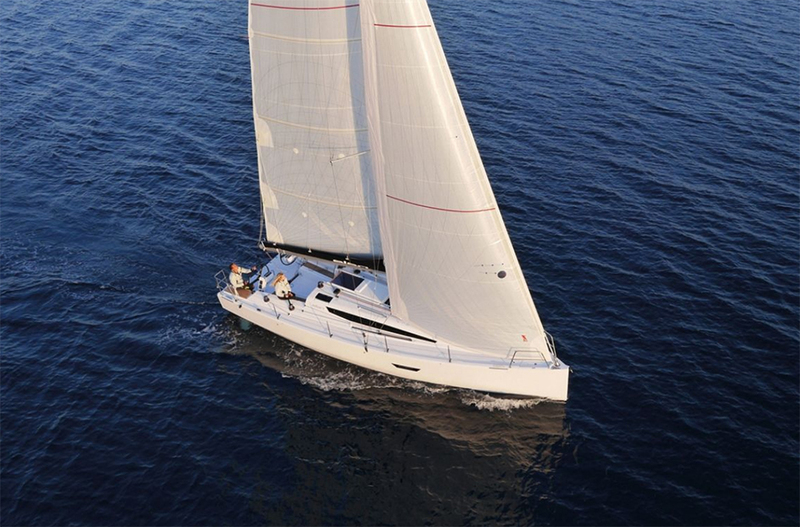 Not much, but enough to show the agility of this boat that is responsive and likes a light touch on the helm, even with all the additional equipment. 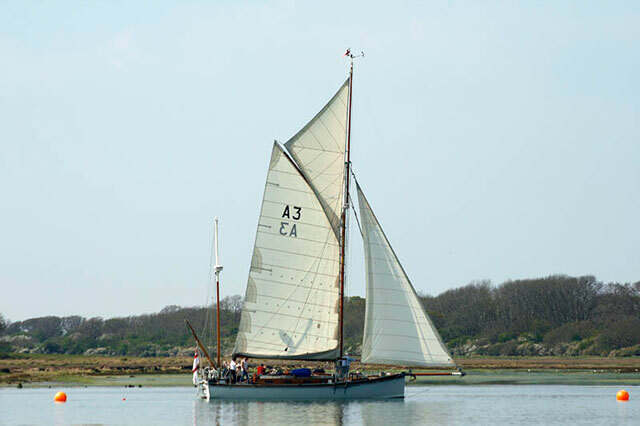 Her 5.4 knots close hauled and 5.2 knots on a tight reach under main and jib only hint at what she’d do if sailed by an attentive crew that works the traveler, tweaks the sheets and flies a gennaker from the retractable bowsprit. 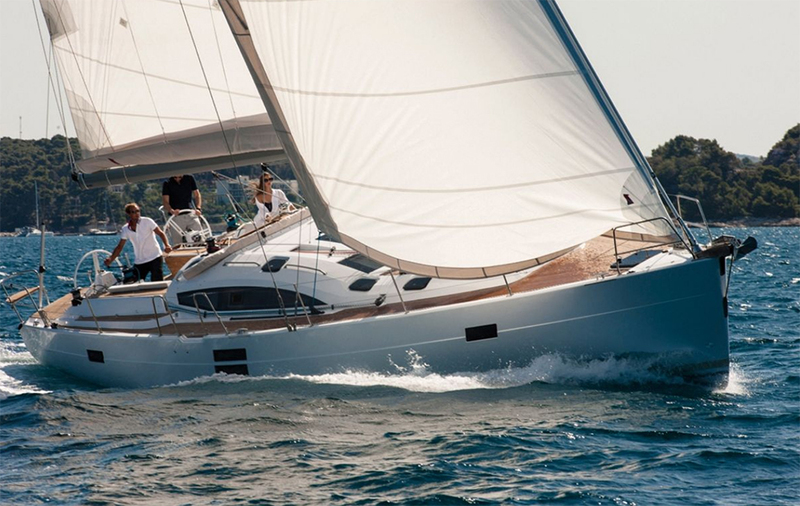 In retrospect it is easy to imagine how the E4 Family Edition is equally capable of satisfying a diverse range of sailing preferences, be it lazy lounging at anchor, spirited sparring on a race course or comfortable cruising around the Croatian islands. The E4 liked a light touch on the helm. Read more of our Elan reviews, Elan GT5 review and Elan Impression 494 reviewx. 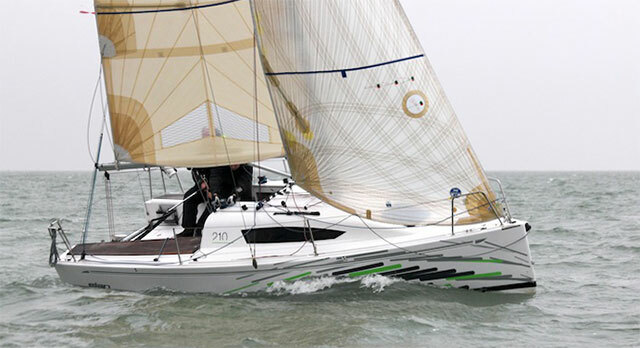 Browse Elan sailing yachts for sale on boats.com.